Kristin Baker, The Unfair Advantage, 2003, acrylic on PVC, 60 x 108". 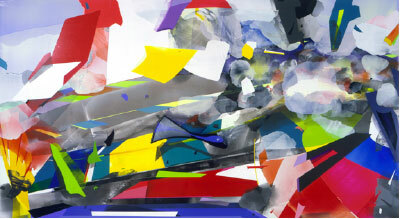 Accident and control, anxiety and euphoria orbit one another in Kristin Baker’s current series of paintings, which is inspired by the seductive theatricality of auto racing and fuses the sport’s electric colors, industrial materials, and iconic imagery with passages of modernist abstraction. The resulting “dysfunctional panoramas,” as the New York–based artist calls them, posit racingwith its combination of mastery, failure, calculation, and chanceas analogous to painting itself, offering an ambivalent reflection on modernity, spectacle, and global consumerist culture in the process. Interpreting the racetrack as a kind of contemporary coliseum, Baker’s works conjure both complicit enthusiasm and tenuous concern toward the popular fascination with sensationalist mass entertainment.